Spend a week in Paris and Nice. Included are the choice of centrally located hotels in Paris, a centrally located hotel in Nice, and services of a Local Host in both cities. In Paris, sightseeing with a Local Guide features a Seine cruise to take pictures of the Notre Dame Cathedral and the second floor of the Eiffel Tower. 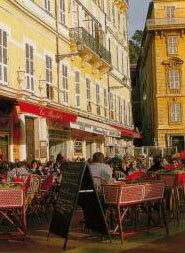 In Nice, sightseeing features the Promenade des Anglais and a walk through the Old Town. The transfer between Paris and Nice will be operated by the high-speed “TGV” train. Various optional excursions are available. * Vacation prices are per person in US Dollars Land Only, based on double occupancy. Single room supplements apply and triple room reductions may be applicable.